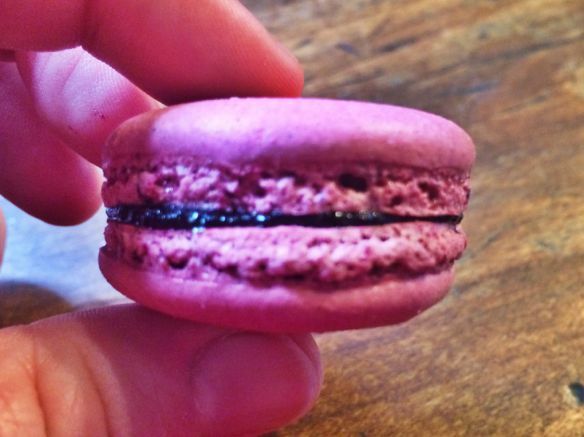 During my semester in Europe, I took more than my fair share of food tours – and, based on my wholly unscientific observations, it seemed like I was not the only one. A quick scan of TripAdvisor shows food tours listed among the highest rated attractions for several cities, and on each tour I took, it seemed people invariably were there because they had taken similar tours in other European cities and loved them. Apparently, a whole subculture of traveling foodies has emerged in Europe, and I am proud to admit that I am among them. While I can honestly say I enjoyed every food tour I took this semester, there are some that stick out as particularly wonderful. Indicative of this point is a conversation I had near the end of my time in Europe, while in Copenhagen, where I found myself taking – what else? 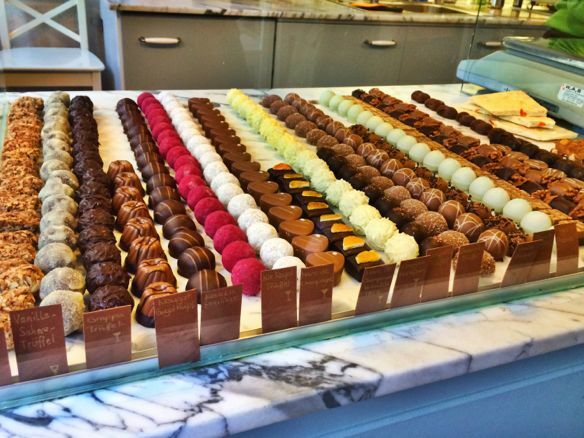 – a food tour. 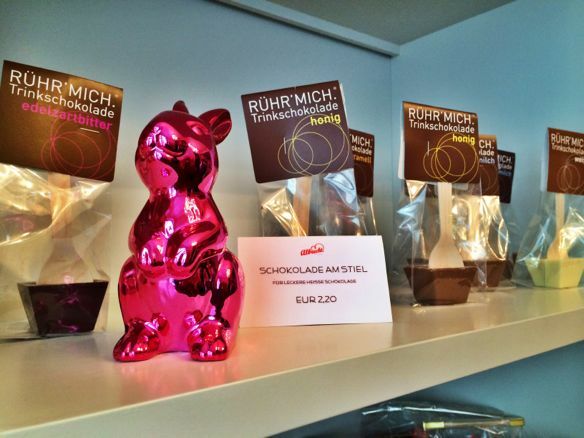 One of the ladies in the group had just visited Berlin, where she had also taken a food tour. I said I had recently been in Berlin and taken one too. “Did you take yours with Bastian?” she asked. “Yes!” I exclaimed, and we laughed, realizing we had gone on the same tour and chatting about how much we had both enjoyed it. We agreed that it had been an excellent, memorable experience. 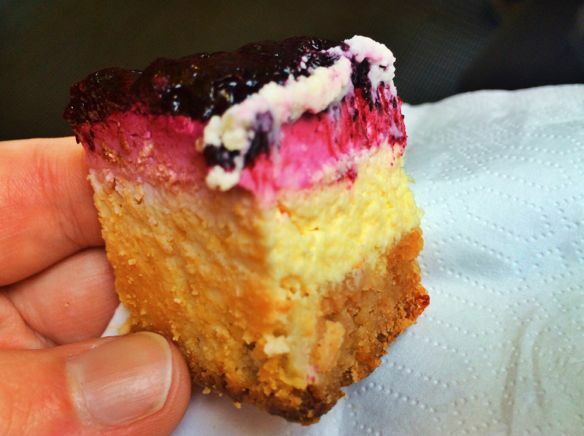 And so, in a sea of Europe food walks, the Berlin Mitte Food Tour stands out as a particularly top-notch culinary experience. 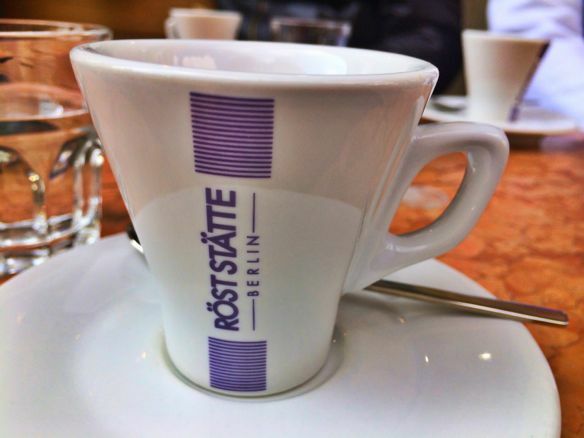 Our guide – the aforementioned Bastian – was excellent, we tasted a wide range of food and drinks, and as we walked through the Mitte neighborhood, we learned plenty of historical and cultural tidbits along the way. 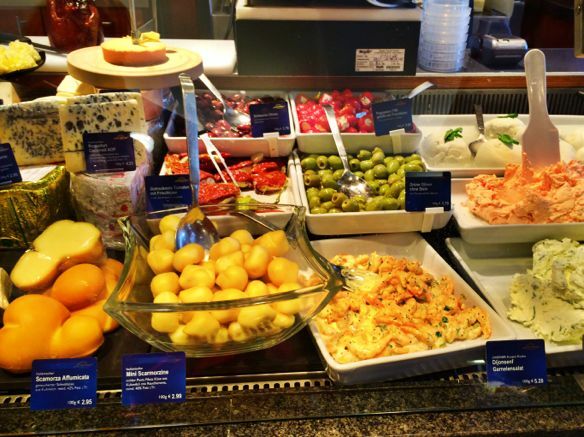 Plus, at under 40 euros, this tour was one of the cheapest ones I took in Europe – and, I got more food than I did on any other tour, making this a great value for the money. 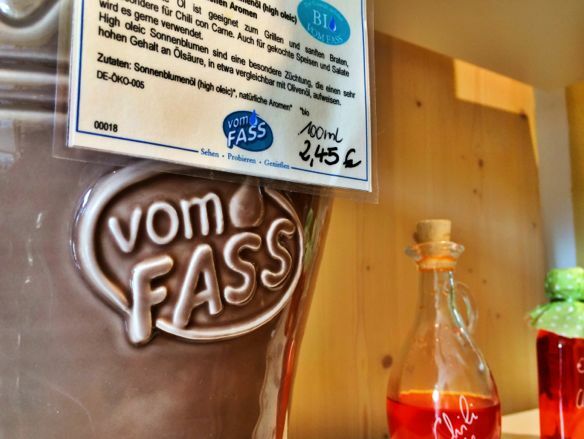 I met up with my tour group near Hackescher Markt at VOM FASS, a specialty shop selling a range of oils, vinegars, wines, and spirits. 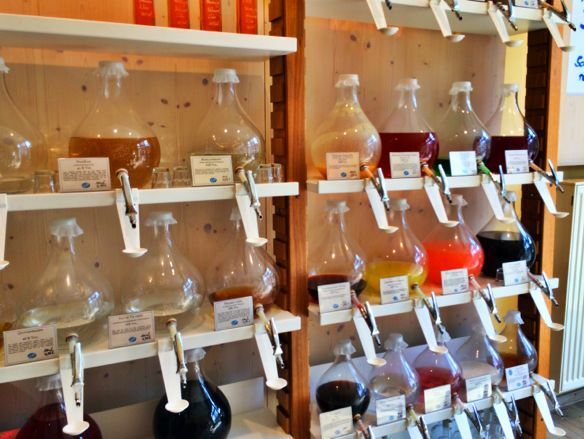 I had visited a similar store in Edinburgh, and here, as there, I enjoyed browsing the shop’s many unique flavors. 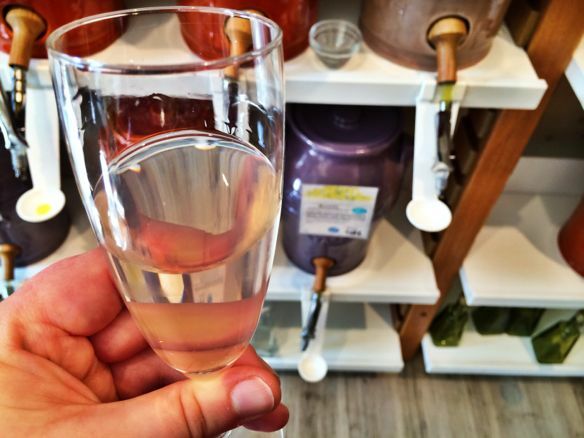 While I would have happily tried everything, we began our day with a sample of a pink grapefruit prosecco, which was light, refreshing, and a perfectly sweet way to start our tour. 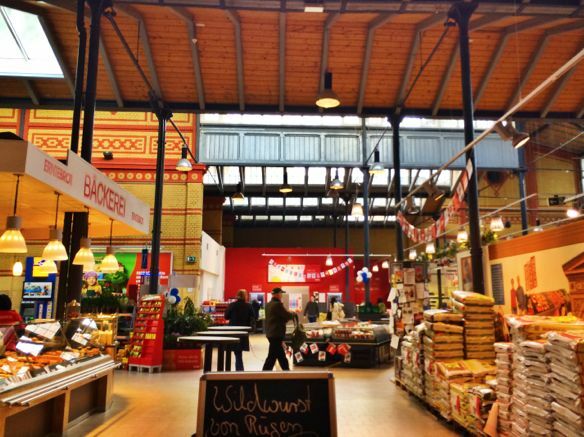 We continued on to Hackescher Markt, a Farmers Market open on Thursdays and Saturdays. There were many stands here that looked appealing, but our destination was the stall selling Turkish cuisine. 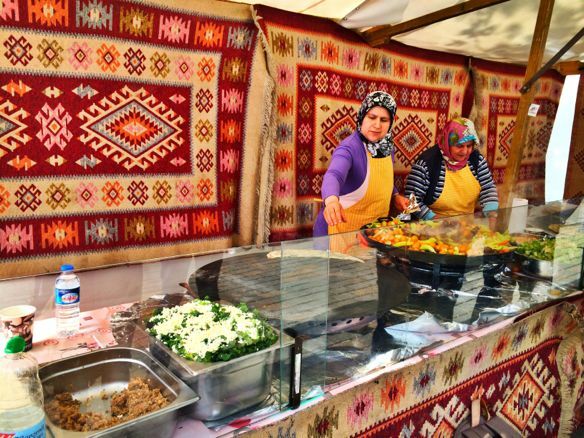 Against a backdrop of colorful tapestries, the ladies served up what Bastian dubbed the perfect hangover food: kofte – Turkish meatballs – with bread and vegetables. This dish was so delicious that I wouldn’t need a hangover to find an excuse to eat it; I would happily partake anytime. While I often think “schnitzel and beer” when I think of German cuisine, this stand was a good reminder of Berlin’s status as a large, multicultural city. 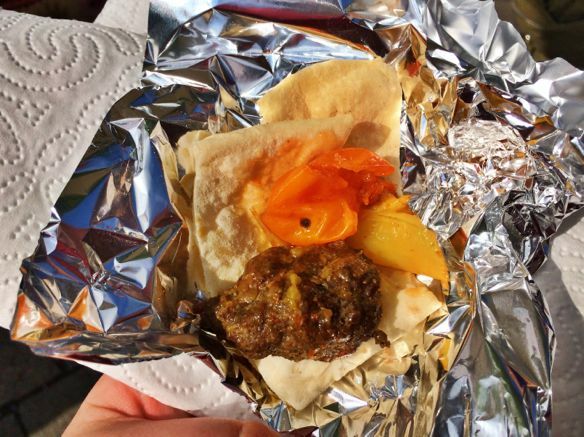 It’s certainly not all about traditional German cuisine in Berlin, and to seek only those dishes out would be to miss a lot of other delicious ones – Turkish kofte included. We headed next to Lindner, a nearby deli. 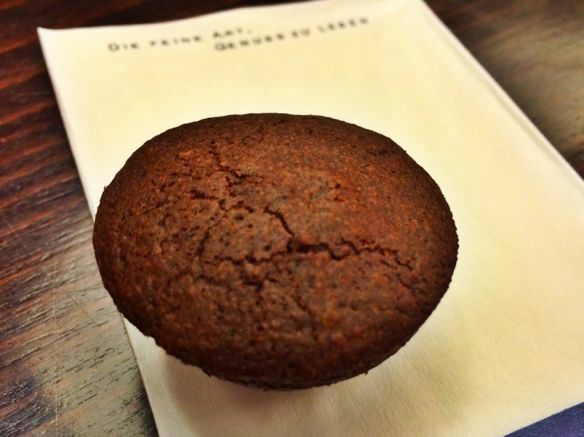 Lindner is exactly the type of place that is great to visit on a food tour. 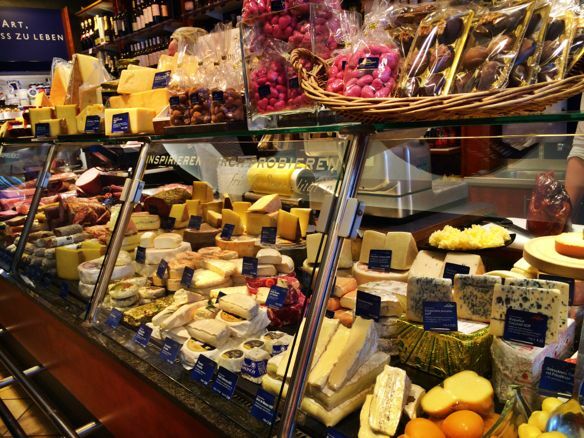 Had I gone on my own, I would have been overwhelmed by all the varieties of meats, cheeses, and vegetables and would not have even known where to begin! In this case, where we began was with meatballs (which resembled hamburgers more than anything) dipped in German mustard. 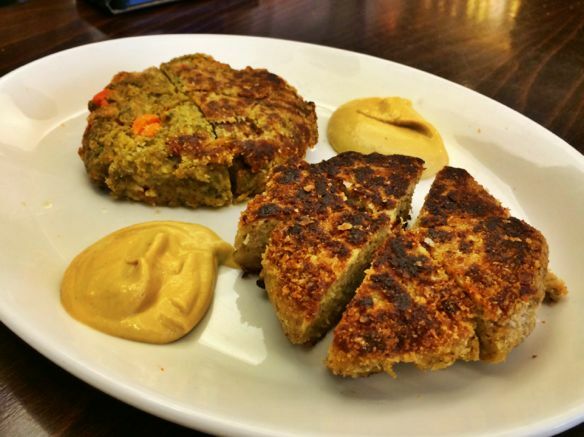 We tried two kinds of meatballs, and the surprise to me was that I preferred the vegetarian option more. It came filled with carrots and Emmental cheese and tasted a lot like Thanksgiving stuffing – always a winning flavor in my book. After our meatballs, we had miniature brownies made with Belgian chocolate. These were rich and delicious, and would have made an excellent topper to a meal – but, luckily for us, we still had many, many stops to come. 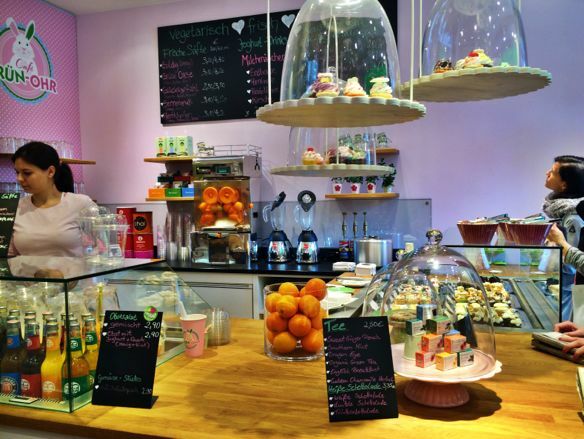 We headed to Katjes Café Grün-Ohr in search of more sweets. 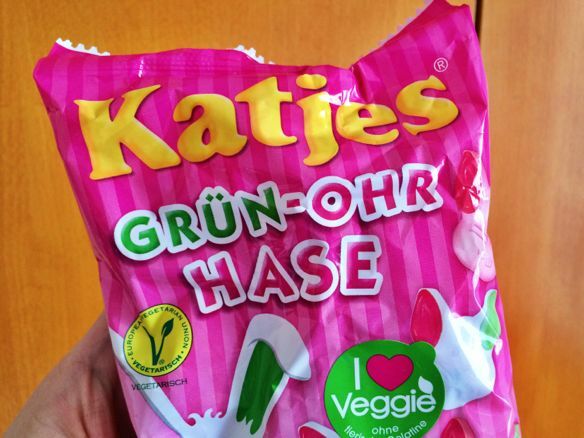 Katjes, a competitor of Haribo, makes fruit gummies and licorice with all-natural products and without any artificial dyes. 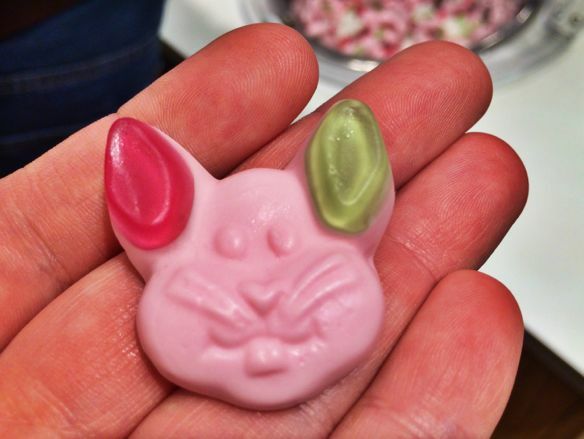 As it was the weekend before Easter when I visited Berlin, we sampled the bunny-shaped candies, and Bastian bought us each a whole bag to take home. I’m not normally a fan of gummy candies, but these were quite tasty (and made for a perfect snack on my flight back to Geneva). 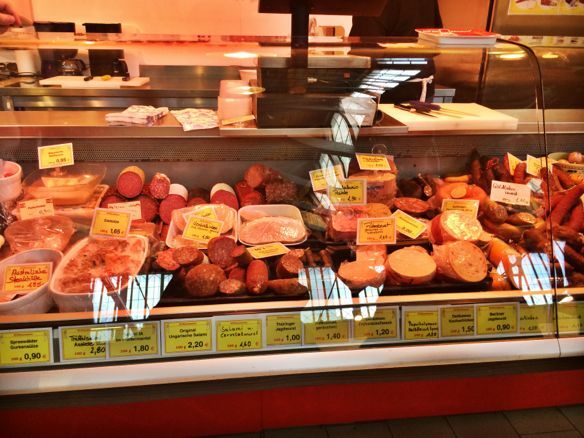 As we walked to our next stop, our guide mentioned that German cuisine is known for four things: beer, wurst, bread, and cakes. While we sampled all four of them in various forms during our day, the next stop, Hofpfisterei, was undoubtedly about the bread. Behind the counter, we saw loaves and loaves of delicious-smelling breads; we wound up sampling the rye (topped with turkey), but they all looked amazing! 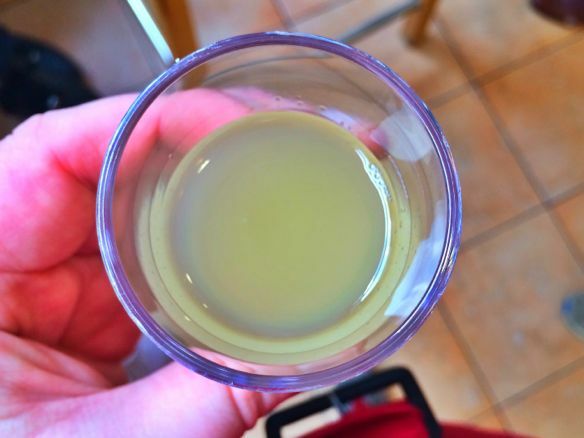 To go with our bread and turkey, we also had a glass of apple juice (which, generally, I dislike, but this was delicious!) and pieces of Leberkasë, or liver cheese (which were too bologna-esque for me to truly enjoy). Next, we began a run of several sweet stops in a row. While there wound up being a lot more sugary treats on this tour than I would have expected, I certainly could not complain – everything was quite good. 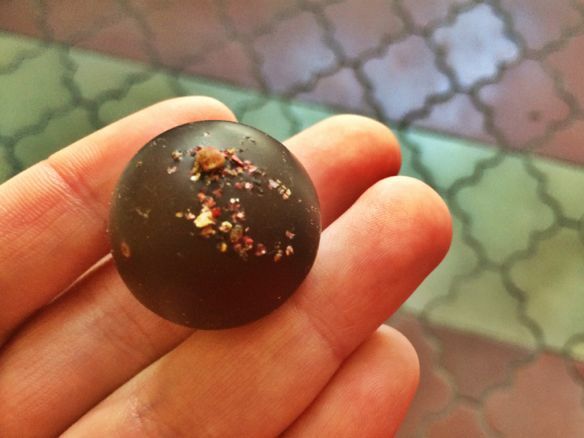 At Albrechts Pâtisserie, we sampled truffles, and, in a moment of blogging negligence, I forgot to jot down the particular flavor of truffle we tried. You’ll just have to trust me on this one: it was good. 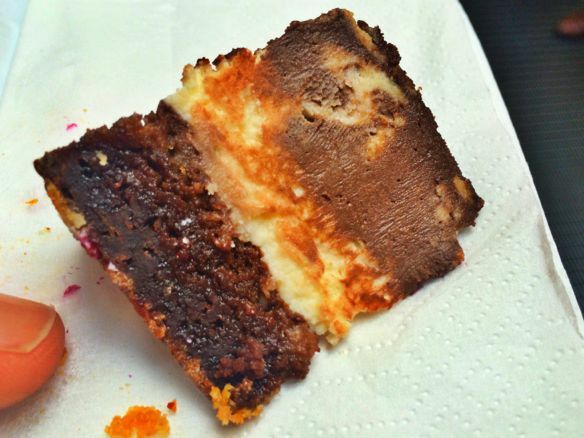 Yes, the cheesecakes were that good (and yes, the crust was amazing). 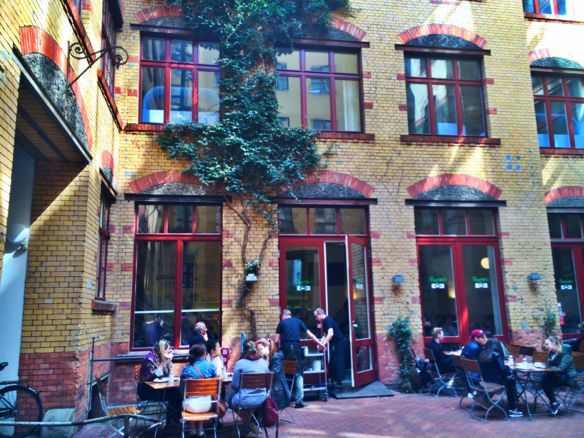 While there were lots of spots on this tour that I would like to return to on future trips to Berlin, Barcomi’s in the place I know, without a doubt, that I would go back to. At Factory Girl!, we sampled the restaurant’s signature dessert concoction: Magnolias, which have a sort of pudding/tiramisu-like consistency. 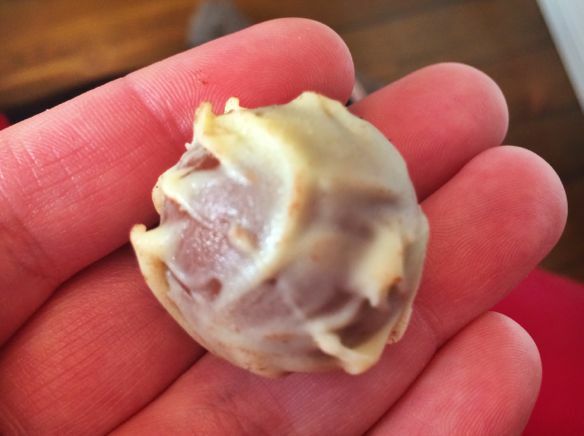 The one we sampled was cookies and cream flavored – and I ate it so quickly that I didn’t even have time to snap a photograph, which is a pretty good indication of its quality. 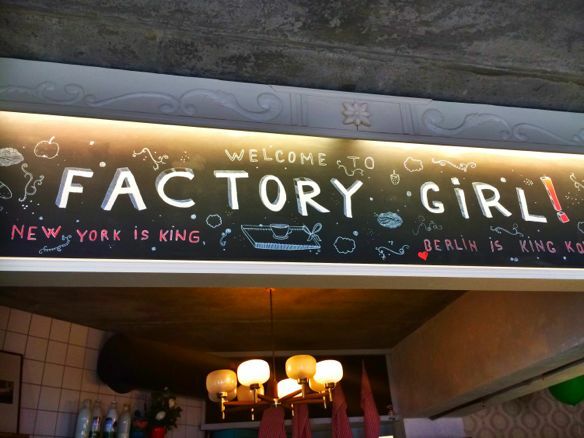 As we made our way from Factory Girl! to our next stop, I began to sense a distinctly hipster ambiance. Indeed, Berlin at large gives off some strong hipster vibes; as I walked around the city, I often found myself thinking, “hey, this kinda feels like Brooklyn.” And the area we were in – with its high concentration of unique coffee shops – certainly fit that mold. 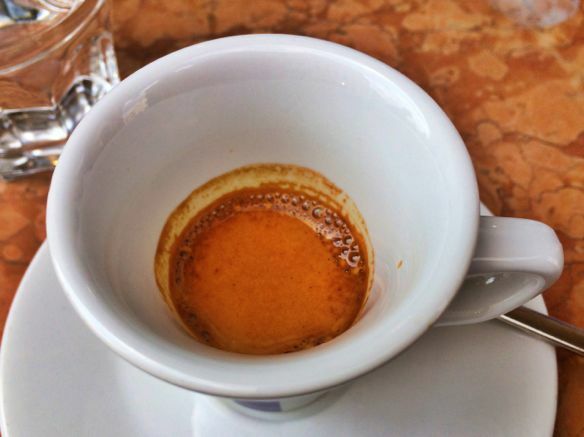 In fact, being coffee connoisseurs – as the folks at Pro Macchina Da Caffè, our next destination, no doubt are – seems like a crucial page in the hipster playbook. At Pro Macchina, we explored the shop for a bit and heard from one of the shop’s coffee experts, who talked to us about the roasting process and explained the merits of various coffee beans. Then, it was time to try some for ourselves, so we grabbed tables outside and tried our small but strong cups of coffee. Our server mentioned that the coffee had fruit undertones, which I could taste, but the fruit was somewhat overpowered by the bitterness of the coffee. In all fairness, I seemed to be the only one in our group who wasn’t in love with this coffee; everyone else was a big fan. I was glad to have a tried it, but I offer this caution. If you’re a coffee snob, you would probably adore Pro Macchina. If, on the other hand, you find the coffee at Starbucks a bit strong for your tastes, then…you may have a difficult time with this stuff! After being jolted by the strength of my coffee, my palette was relieved that our next stop counteracted some of that coffee bitterness with a little straight-up sweetness. 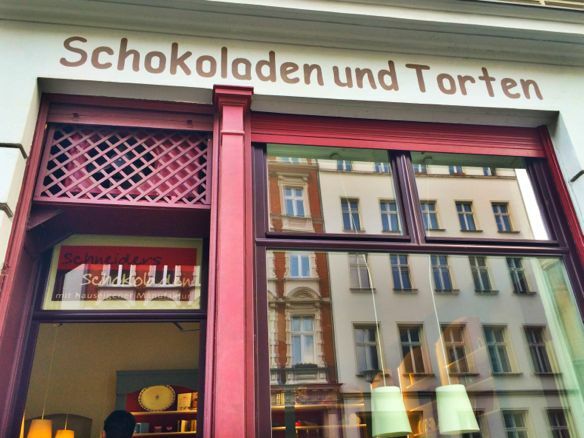 At Schneiders Schokoladen, which makes a variety of gourmet chocolates, we tried a chocolate with balsamic vinegar. As far as flavor combinations go, this felt pretty unexpected to me; I would never associate balsamic vinegar with chocolate! However, these guys know what they are doing, as the combination of the two flavors produced a tasty – and memorable – piece of chocolate. After all those sweets, it was time for some heartier fare. 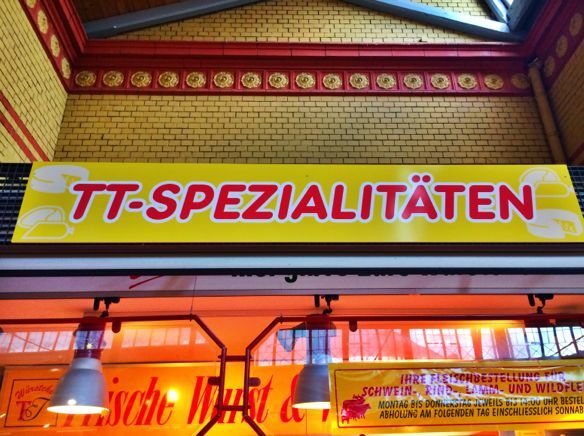 We headed to a market hall for some wurst (sausage) from TT-Spezialitäten. We tried a sausage whose name I didn’t catch – but, I do remember our guide explaining that it translated to something like “acre watcher” in English. Why “acre watcher”? Farmers kept it in their pockets while working out in the fields so they could have something to snack on. A pretty ingenious idea, if you ask me. 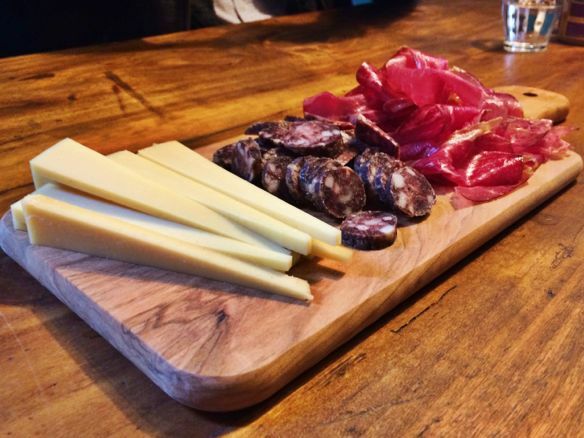 We then headed to Vom Einfachen for some cheese and charcuterie, plus a little IPA to wash it all down. 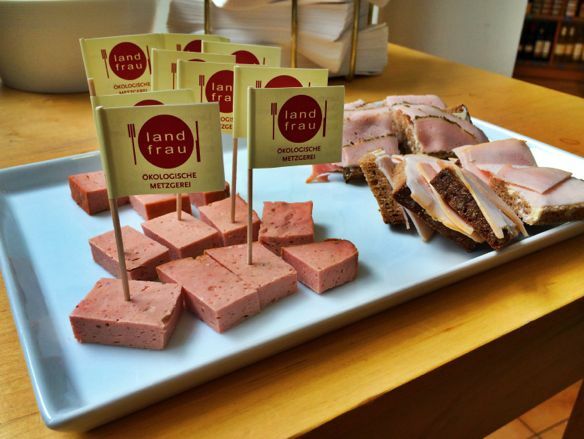 We tried a trappist cheese, liverwurst, and a super thinly sliced, dry aged ham. All three were good, but the ham was my favorite – absolute meaty perfection. Our next stop was both my most anticipated and most dreaded stop of the tour: currywurst at Curry 61. 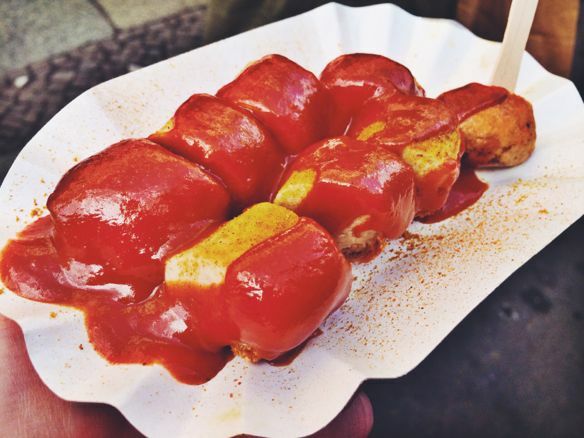 It was my most anticipated because trying currywurst is basically mandatory when in Berlin, so I knew I had to do it. However, I’m not a fan of curry generally, so I was a bit leery of trying sausages drenched in curry ketchup. As it turned out, I needn’t have worried – this currywurst was really good! While you can find currywurst stands all over Berlin, my sense is that they vary in quality dramatically. 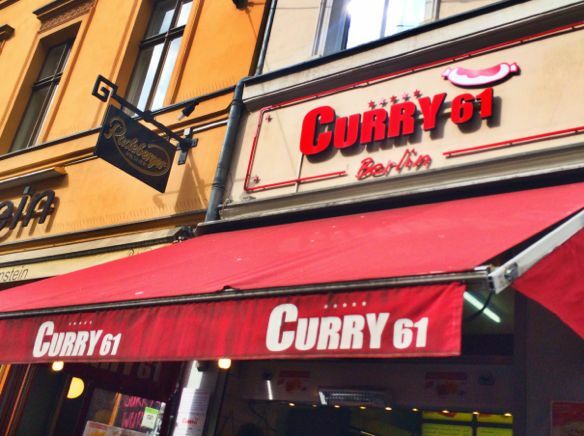 Curry 61, however, seems to be one of those spots where you know you’re going to get a good one. 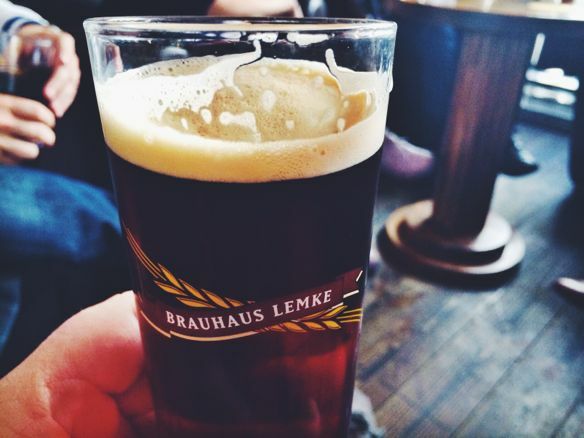 Our final stop of the tour was Brauhaus Lemke, a microbrewery near where we started our tour at Hackescher Markt. Bastian mentioned that craft beers are becoming a big thing in Berlin these days, and I can see why because even I, as a non-beer drinker, really enjoyed my beer! 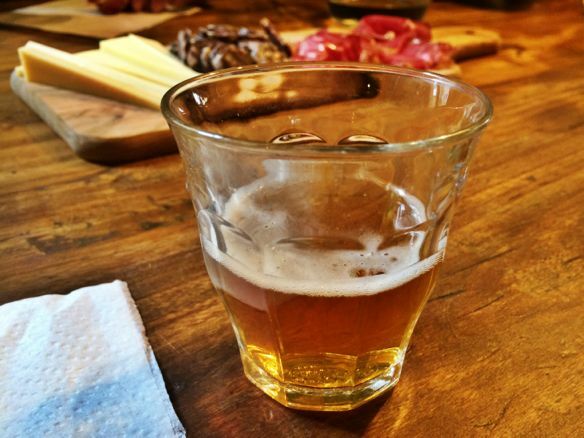 As I left Brauhaus Lemke and headed back to my hotel to nap off my food coma, it occurred to me why I enjoyed this food tour – and all food tours – so much. To me, there’s something really amazing about encountering people who are passionate about things, and who have found their niches – however obscure or quirky they may be. The coffee connoisseur who intimately knows every imaginable variety of coffee bean, the chocolatier who dreams up wacky-but-wonderful flavor combinations, the baker who takes care to make sure each loaf of bread is baked to perfection: these are people who dedicate their lives to cultivating delicious things. It’s inspiring to witness their passion in action, it’s fascinating to pick up little pieces of their knowledge, and it’s a treat to taste the fruits of their labor.